For a band who record a charity Christmas single every year, it's surprisingly hard to find a picture of The Killers wearing Santa hats or shiny red noses. This is disappointing. Less of a letdown, however, is this year's entry into their Christmas canon. Feel It In My Bones is a smoky, impatient rock groove, featuring the return of the Psycho Father Christmas from 2007's Don't Shoot Me Santa, played again by Ryan Pardey. Recorded in one-day on a pit stop on their current world tour, the song is by no means dashed off. 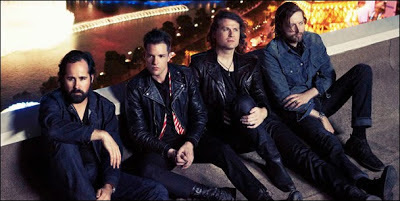 In fact, it trumps a couple of tracks on their current album Battle Born. Once they hit 10 tracks, The Killers' Funtime Christmas Party Album is going to be something quite special, isn't it? Feel It In My Bones is out on Tuesday, with all proceeds benefitting Aids charity (RED).